Regardless of whether an electrical control panel will be used in motor controls, PLC controls, an operator interface or pneumatic/hydraulic controls, keeping the design simple can mitigate manufacturing complications and even prevent post-installation servicing issues. Space – The size of the enclosure dictates how much space is available for wiring and components. While it’s important to include every part essential to control panel functionality, looking for ways to reduce any clutter should also be a priority. Common parts – Using common parts throughout the design will keep the controls uniform, make them easier to label consistently, and could provide price breaks for large quantity purchases. “Or equivalent” – Adding this phrase next to components included in the design that could be exchanged for a different brand or type makes it easier for the buyer or builder to make substitutions as necessary. This is particularly helpful if there are issues procuring the exact part or if it’s more expensive than other versions. The buyer or builder won’t need to waste time seeking permission to swap parts. CAD information – If more than one of the same electrical control panel is being built, providing detailed information about enclosure cutouts, hole sizes and locations streamlines the process, saving time and money. Removable back panel – The back panel for the enclosure, which serves as the mount for all of the components, should be removable. The builder can then work on the wiring outside of the enclosure, on a flat surface. This makes it easier to secure each component and route the wire without having to reach into the box, cutting down on labor time. Once the routing is done, the back panel can be dropped into the box and secured to the enclosure. 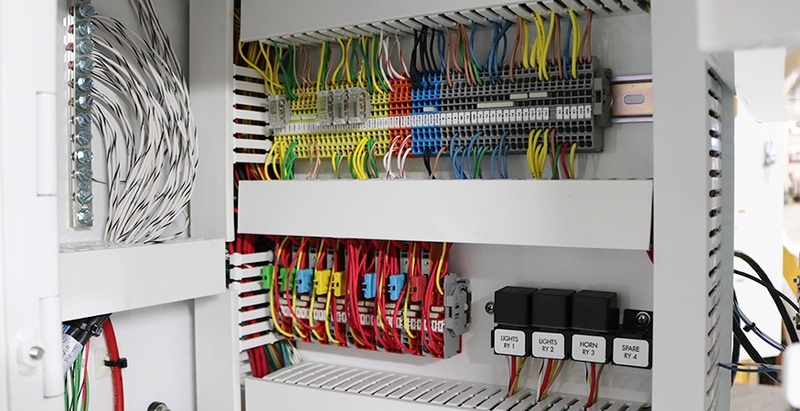 Wiring duct – Using wiring duct to keep wires in place and protect them through the routing process helps the control panel builder remain organized during manufacture and keeps the panel neat as long as it’s in service. DIN rail – These metal rails can be used to mount circuit breakers and other components to the back panel in straight, neat lines. After the rail is screwed into the back panel, the builder can snap components into place. Labels – Each wire and component should be neatly labeled so anyone who services the electrical control panel can easily find and address problems. The labels, however, should not be placed directly onto the component (if possible) as a new label would need to be made if the component ever needs to be replaced. Installation – Be sure to design the control panel so that it will be easy to reach, operate and service after installation. Drawing – Place a reference drawing of the electrical controls inside the door of the control panel so anyone servicing the panel can find the right components quickly. Perhaps the best way for OEMs and industrial designers to save time and money is to partner with a contract assembly partner with experienced engineers who can review drawings, quickly spot areas for improvement and perfect designs using DfM principles and the latest technologies. MCL is that kind of partner, and we’re here to help your organization by providing a free design review and cost-saving analysis of your electrical control panel using our proprietary enhancement process. Simply click the link below to request your review today and, as always, reach out to our team with any questions.